A beautiful blend of form and function, this artful wine wall clock creates an elegant focal point—bringing a fresh new look to any space. Wonderfully detailed in handpainted metal, its intricate grapevines, bottle and wine glass enhance a classic clock, graced with sophisticated, easy-to-read roman numerals. Kitchen wall clock uses 1 AA battery (not included). Easy 2-pc. assembly; includes a hook for hanging. 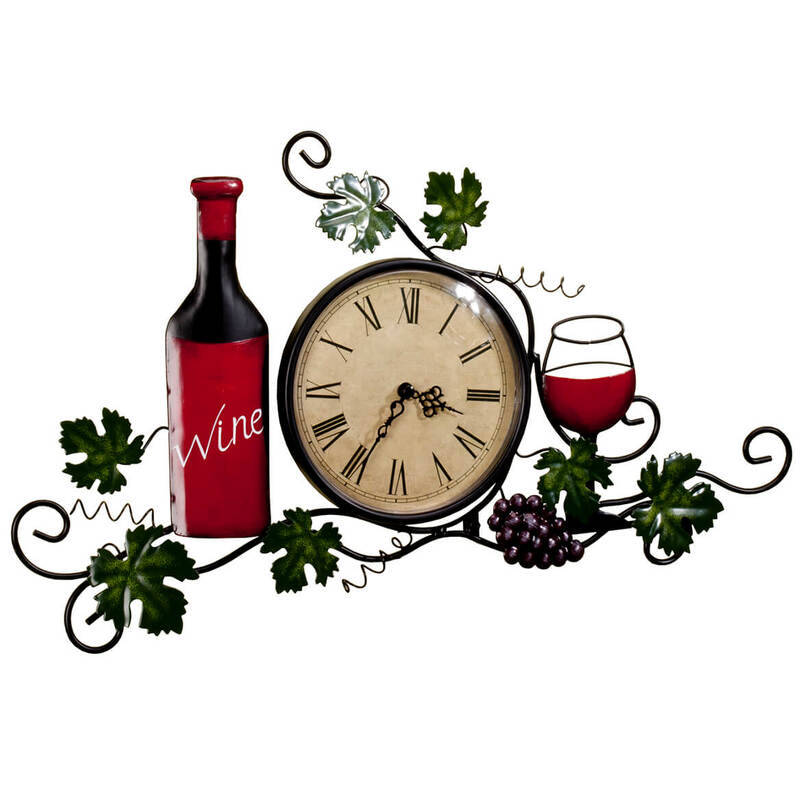 Wine clock measures 20″ long x 12″ high with 6 1/4″ dia. clock face. Besides indicating time and date, this wireless weather station clock reports indoor and outdoor temperatures—helping you dress appropriately for a morning walk (or know when to stay in!). Convenient features include 12 hr./24 hr. display, 2 alarms with snooze settings from 5 to 30 minutes and 9 minute memory time. It also displays weekday/date or date/month calendar, along with year 2000-2029, time zone settings: PST, MST, CST or EST, and hour/minute/seconds with dot display. 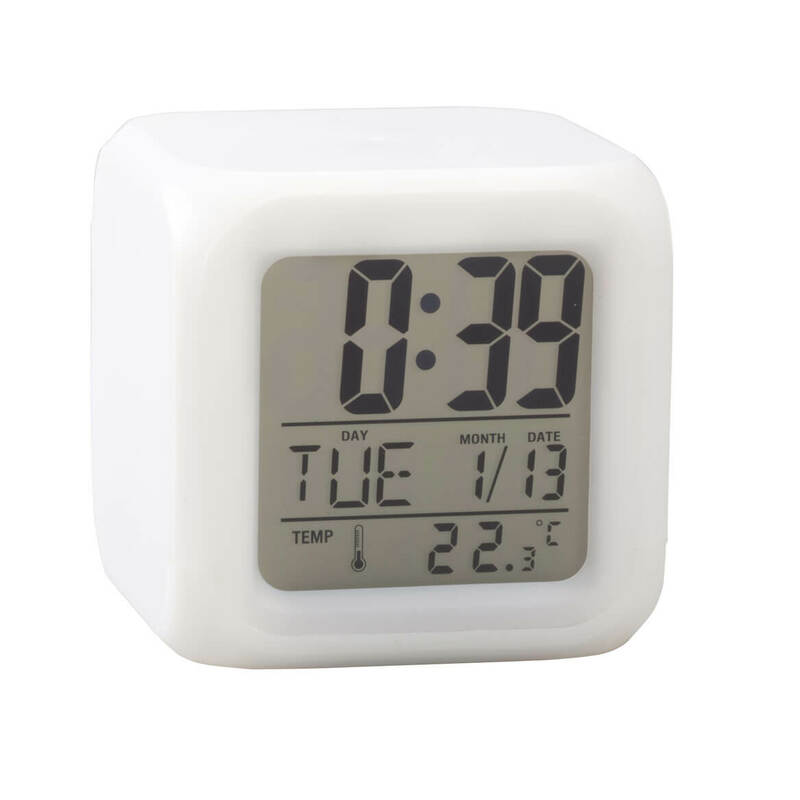 The wireless clock’s handy remote sensor transmits wirelessly to the indoor receiver, displaying indoor/outdoor temperatures in Fahrenheit with minimum and maximum recordings of 32-122 degrees. 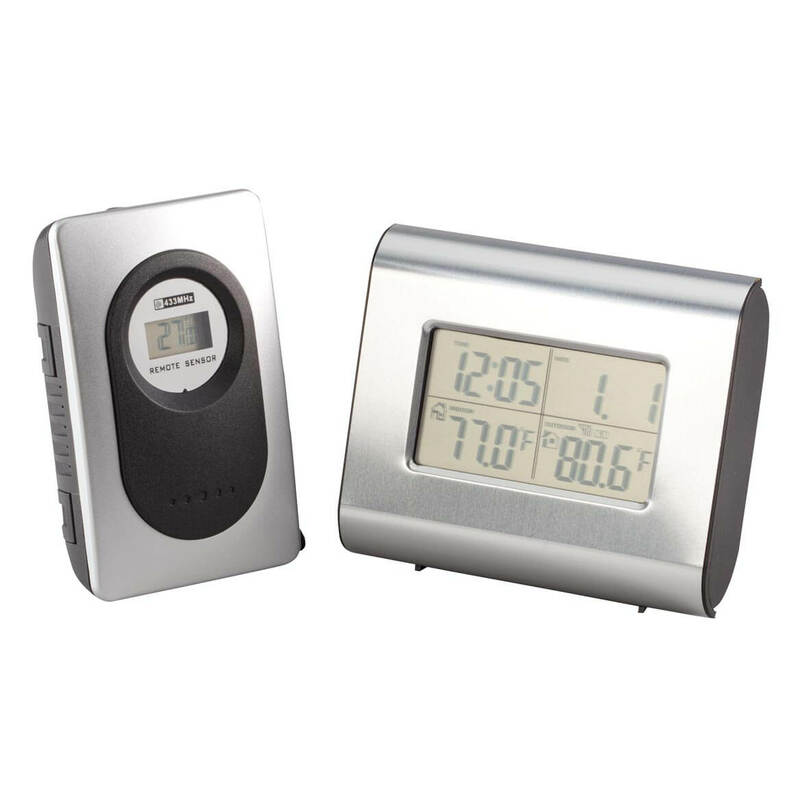 Valid distance for transmitter and receiver is 328 ft. Digital weather clock requires 4 AAA batteries (not included). Receiver: 4″ x 3 1/4″ x 1 1/2″. Sensor: 3 3/4″ x 2 1/4″ x 1″. Even the soundest sleepers can’t miss the resounding wake-up call this little heavy sleeper alarm clock belts out! And don’t look for mercy from the snooze function, since this alarm clock only gives you 4 short minutes to drift back to slumber … increasing the volume with each press. Sure to wake the heaviest, hibernating sleeper, it’s a great gift for night owls of all ages. 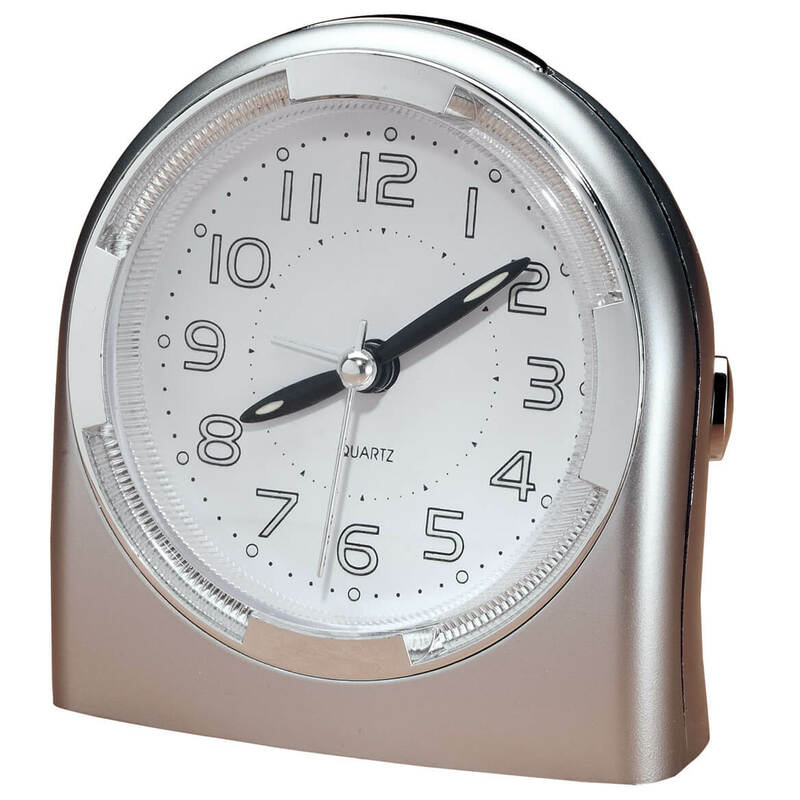 Loud alarm clock features quartz analog movement with glow-in-the-dark numerals and hands. Requires 1 AA battery (not included). Plastic. 3 3/4″ wide x 4 1/4″ high x 2 1/4″ deep. LED color changing digital alarm clock adds color to your mornings! Wake up to a basic alarm or choose from 8 built-in tunes such as “Auld Lang Syne.” Large, easy-to-read LED clock display shows time, day, date and temperature at a glance. Fun LED feature changes the clock’s color, cycling between white and lively hues of pink, blue, red, yellow and green. Whether waking up for school or work, or setting an appointment reminder, this digital clock makes a great gift for any age! Requires 3 AAA batteries (not included). 3″ cube. 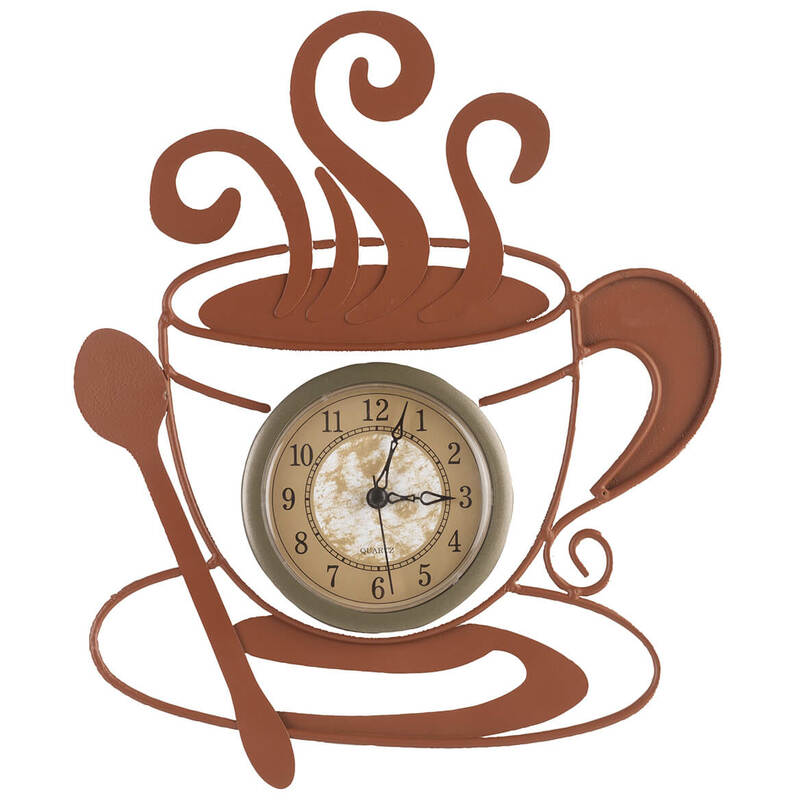 A perfect blend of fun and function, this metal coffee cup clock is pure java joy for the coffee lover’s kitchen. Waking up any tired or ho-hum wall, the decorative metal clock features swirled rising steam, scrolled handle, cute stirring spoon and classic, easy-to-read face. Coffee clock includes sawtooth hanger for easy display; requires 1 AA battery (not included). 9 1/4″ wide x 10 1/2″ high frame, 3 1/4″ dia. face. 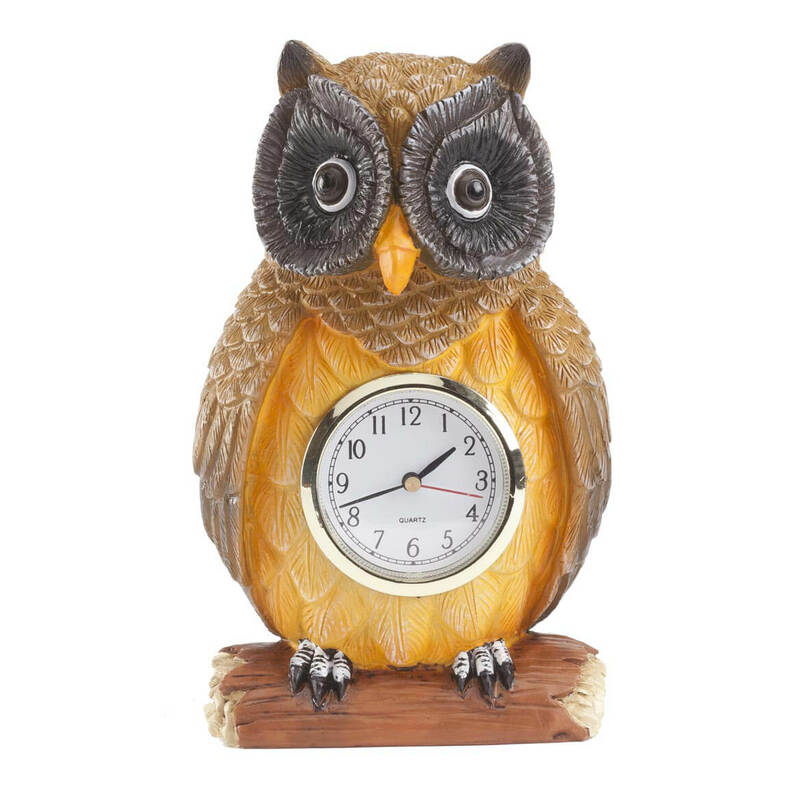 Add a fun accent to your décor with this vibrant resin owl clock. Perched on a branch and keeping watch, it makes a whimsical style statement on a mantel, table or shelf. It’s crafted with 360° of highly detailed resin right down to his feathers, and features a 2 1/4” dia. clock face with easy-to-read numbers and a red second hand. 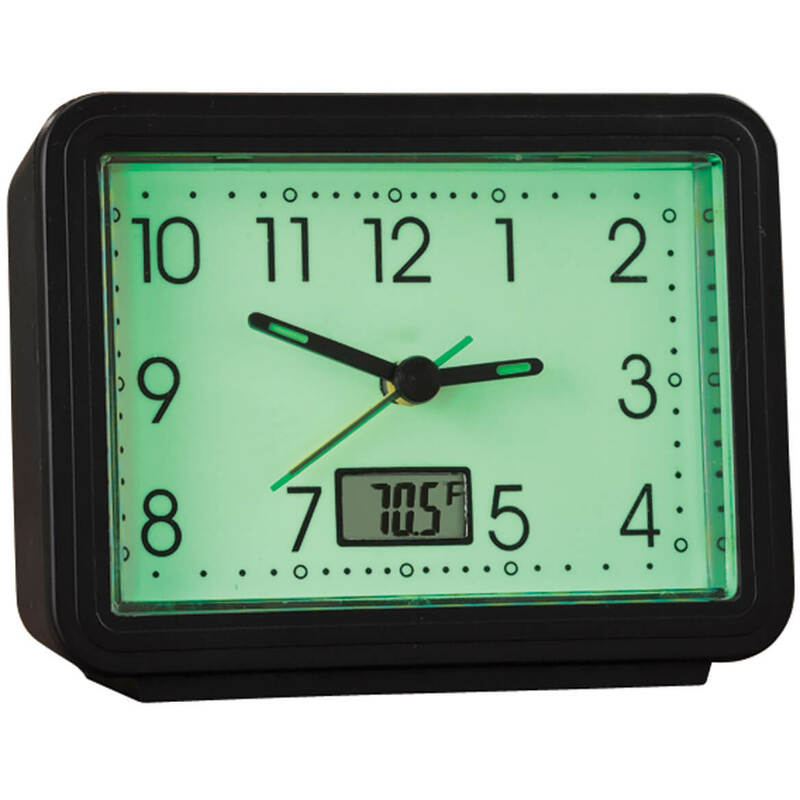 Table clock measures 7 1/4” H x 4 1/4” W and requires 1 button cell AG13 battery (not included). Simply select your time zone, and this modern 12 in atomic clock sets itself using synchronized signals from the atomic clock in Colorado. Our atomic wall clock features accurate quartz movement, adjusts itself for Daylight Savings Time and never needs resetting! Classic, dome design features 9″ diameter face for easy reading. Specify: Black or Silver. Analog atomic clock uses 1 AA battery (not included). With large easy-to-read numbers, our 10″dia. 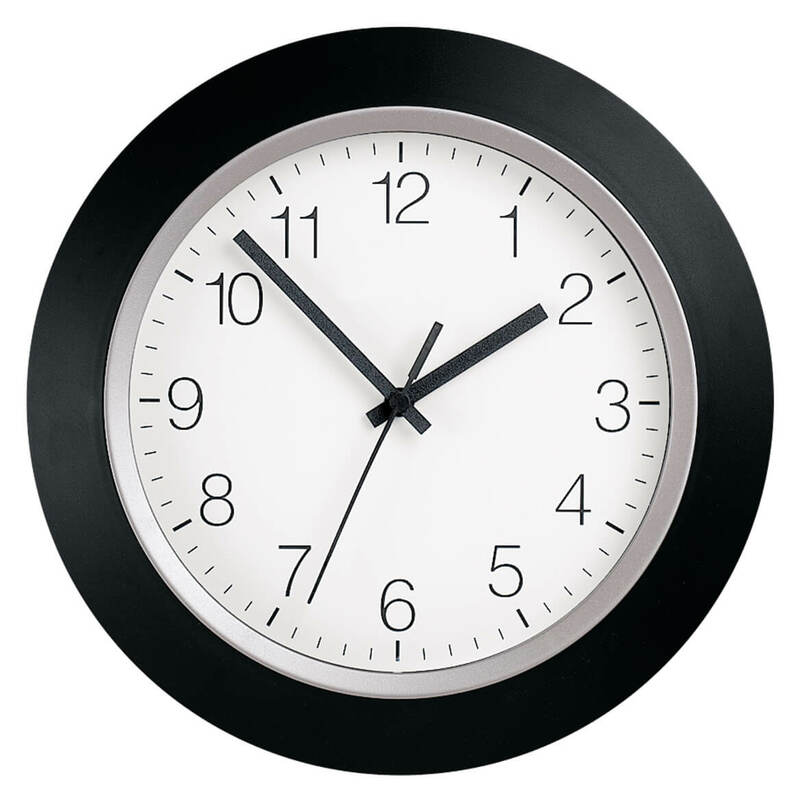 retro wall clock is easy to see from a distance—and easy to love with charming, nostalgic style. 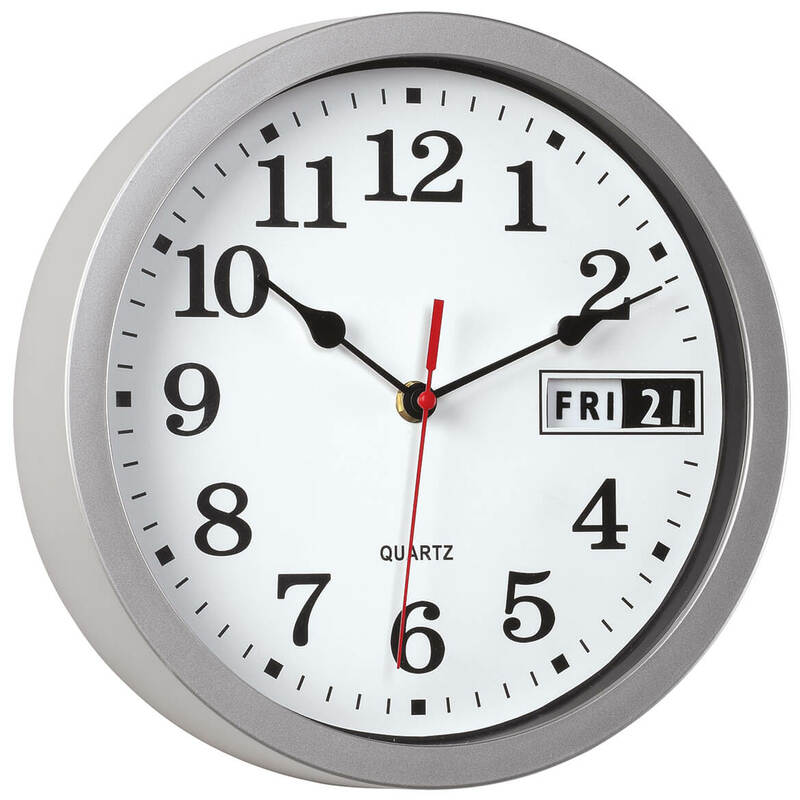 Classic wall clock displays time with old-fashioned hour and minute hands, red second hand and day/date that flips automatically in retro style. Requires 1 AA battery (not included). Durable plastic; features keyhole for hanging. Charming wall décor is right on time! 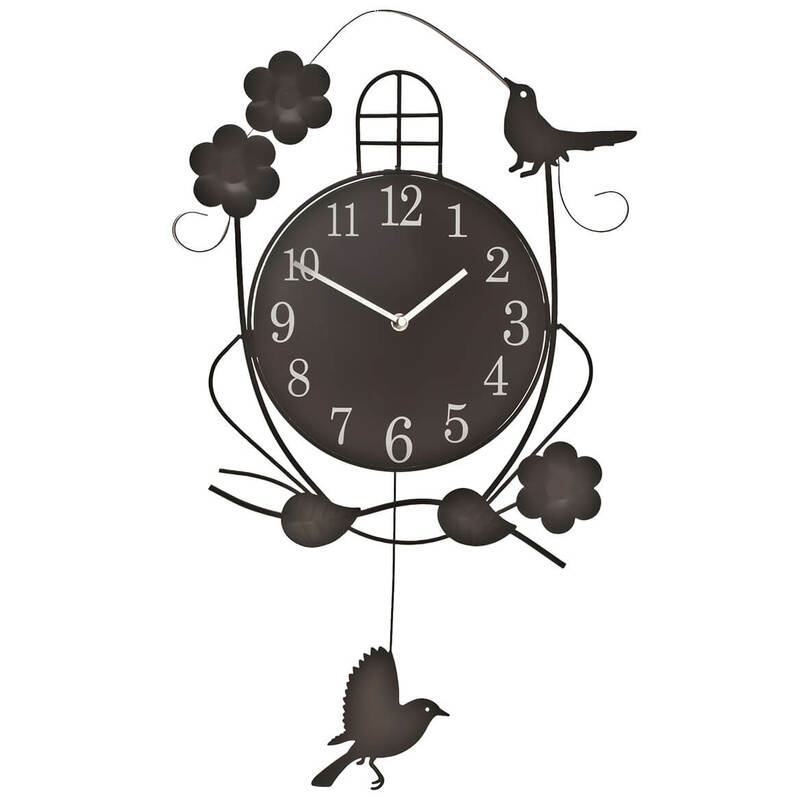 Stylish metal clock features a feathered friend on its swinging pendulum. Atomic time piece is always accurate and its large numbers are easy on the eyes. Quiet operation—no chimes or other disturbances. Requires 2 AA battery (not included). Clock measures 143/4″Wx2’L with pendulum; face is approx. 91/4″dia.